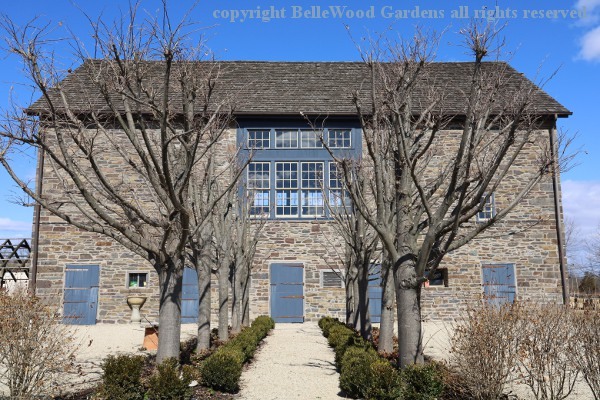 Linden Hill Gardens in Ottsville, Pennsylvania is a nursery known for superb plants for sale and wonderful display gardens, vignettes of elegant design and artful accoutrements. 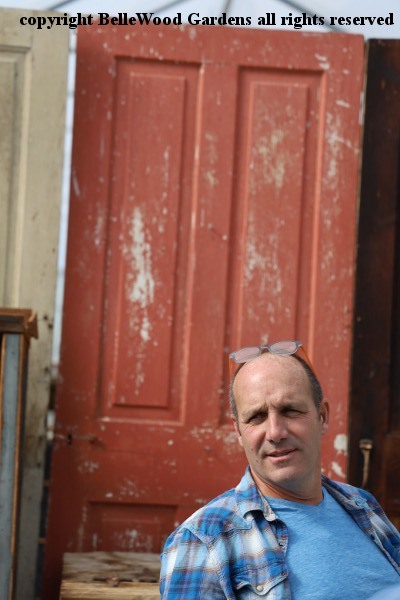 Jerry Fritz, the amiable owner, designer, raconteur, welcomes each spring season with a horticultural chat room wherein he presents the audience with information about a handful of exciting new plants - from trees to shrubs, perennials and annuals - that he will have for sale. So of course I head across the river (the Delaware River) and over hill and dale for some socializing. My first stop, after parking, is at the attractively appointed cottage with a wash room - my morning coffee is making its usual demands. 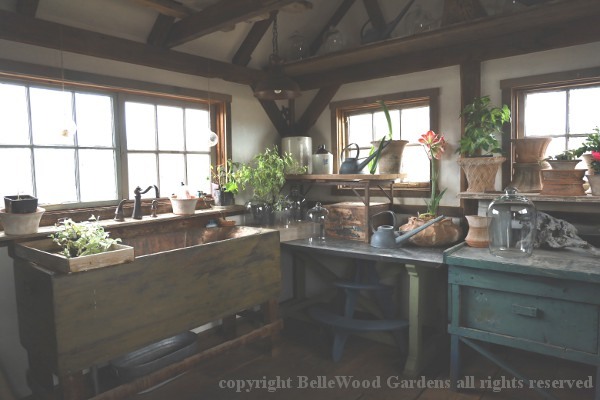 Like all of Linden Hill it is not merely functional but also visually interesting and attractive, what with watering cans and bell jars, worn painted surfaces, pots and plants, including an amaryllis in flower. 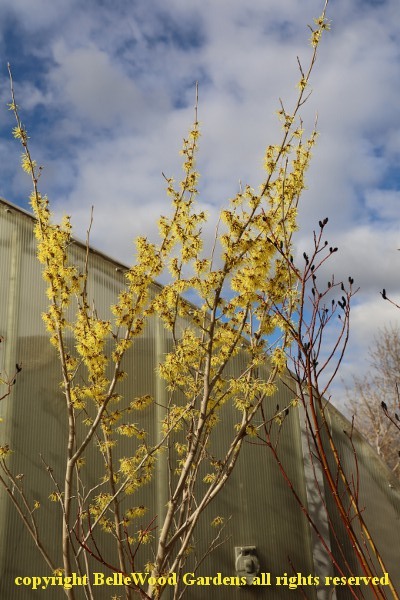 passing some native witch hazel, Hammamelis vernalis, in fragrant bloom. 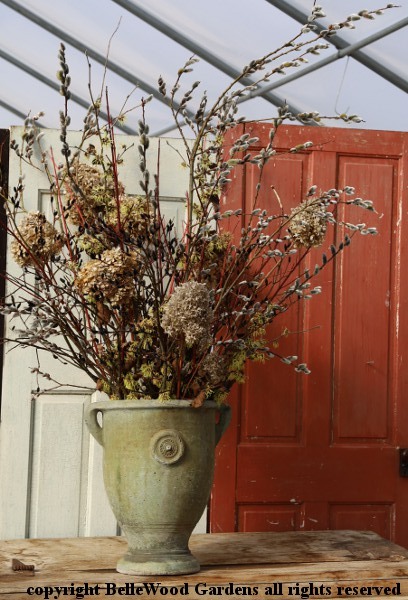 hydrangea with last year's faded flowers decorating the space. Today is rather cool and very breezy. The greenhouse is so sunny and bright that Jerry was squinting. And asked the nursery staff to open first the rear door, and then the one at the front. There's coffee and cookies for us to serve ourselves before taking a seat. No pictures, just Jerry describing a couple of new trees he'll have available, such as Metasequoia 'Amber Glow' with bright golden foliage turning orange in fall before dropping. Shrubs next, including Edgeworthia chrysantha, with fragrant creamy flowers on bare branches in March to April. He'll be offering specimens from a zone 5 nursery in North Carolina, but warns it still needs a protected site. One annual, a vine to treat as an annual, and a handful of perennials. Next weekend, March 23 and 24, will be snowdrop days. 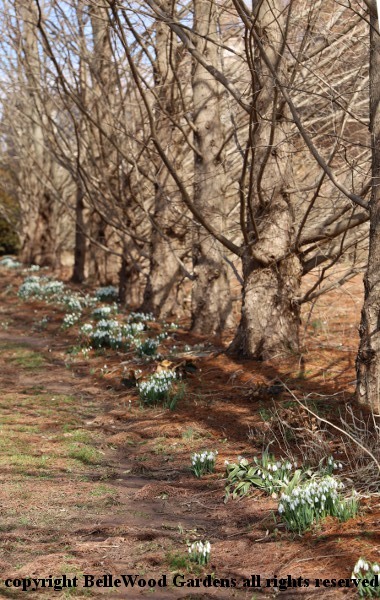 Come and shop for both classic and unusual snowdrops. Even the rare ones, Jerry says, he is offering both at the nursery and online. And some of the rare ones are already sold out. With the recent warm weather he's concerned that the snowdrops in the garden may be finishing. Since we're here, he urges us to do go look at the snowdrops under the metasequoia allée. Which of course sends me on my way there. Planted as whips, metasequoia grow fast, to the point where Jerry is thinking they need thinning. But today the double colonnade makes a superb frame for the elegant snowdrops nestled at their base. Photographic itch satisfactorily scratched, I turn around to go back to the parking lots. And pause for one more image, of the huge stone bank barn and double row of pollarded trees.